To identify which model refrigerator you have, look for the serial plate in one of the three locations noted below. Besides the model number, you will find the serial number, which is necessary when contacting Norcold about your refrigerator. Serial Plate location prior to January 1984. Serial Plate location between January 1984 and April 30, 1995. 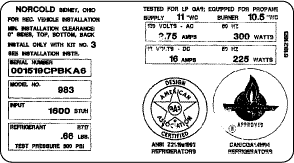 Serial Plate location after May 1, 1995. To access the product registration form click the button below.